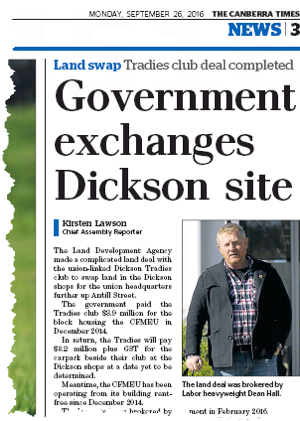 “The LDA is getting land in between the Dickson pool and the Majura playing fields, part of Section 72, also known as Dickson Parklands. This is part a longer term plan for the ACT Government to develop the entire area as it sees fit,” continued Mr Hettinger. Mr Hettinger continued, “Meanwhile, the LDA’s record with the community on Dickson Parklands is dismal. Consultations in late 2014 showed that the community opposed residential development in Dickson Parklands, instead supporting reserving and developing the area for further community use. “When community reps finally met with the LDA to what they thought was to further negotiate a mutually acceptable option, the LDA had already prepared and sent out a media release with its own preferred option. That option was – you guessed it – residential development,” said Mr Hettinger. “This is no way to govern a territory. Dealing with the bureaucrats has been a waste of time, and it shows how shambolic the governance arrangements have become. The only way left to make a difference is through the Legislative Assembly. If ACT citizens want to return effective governance to Canberra, they must vote for an independent crossbench. That means voting for Canberra Community Voters, preferencing other independents, and leaving the three major party columns blank,” concluded Mr Hettinger.